I’ve been seeing a lot of posts lately about worth. Some have been about how to share your worth, being true to it or even questioning it. Lovelies, you have NO idea what you are worth. And you cannot ever know the unimaginable ways that you have affected this world as you walk through it. It’s not for you to know…it’s not all that important. Needing to know is ego. 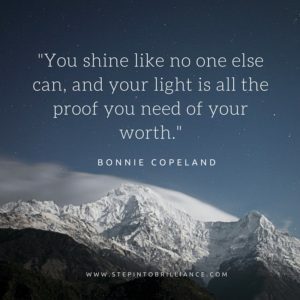 You shine like no one else can, and your light is all the proof you need of your worth. When you take the shutters off and let it out into the world you are going to create amazing things. Some of which you might not even realize. Your job is to be a light in the world by living from love and sharing your purpose. You see, your worth is incalculable. It’s divinely given. You don’t need to justify it to anyone, anywhere at any time. You don’t need to add it up, compare it or worry about it. It’s a given, just like the air we breathe. That is the truth, it is always the truth, no matter what. Your worth is non-negotiable, unless you start the negotiations. Every time you work from your passionate heart, there is a ripple effect that goes out into the world – and this world needs that. It can be as simple as speaking a word that makes it click for someone else so they can now go on to share their own soul light. Or a smile that shifts perspective for someone and helps them make it through a terrible day. It can be a product of yours that someone buys and they might never write you that glowing testimonial – but it did change everything for them. My point here is you are worthy. You always have been. The only one who can take your light and make it unworthy is you. You are only and ever responsible for taking care of your purpose, your light and your Self. That is all. Do that and you are shifting energy, changing and healing the world. That’s a worth pretty much everything and all of it!